Discover Brussels’ European district, a piece of Brussels where only few tourists end up. With the printed documents and a map of the quarter, you try to find the missing ‘Eugene Ryckevelde’. 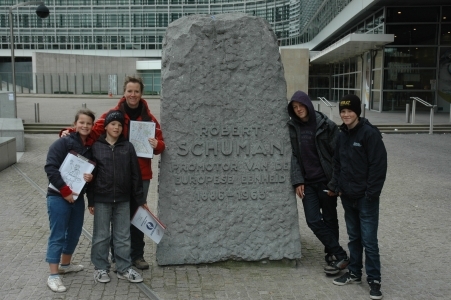 Your quest will lead you from the Schuman Square to the Place Royal (close to Brussels Central Station). This adventure quest is done in small groups from 2-6 persons. You can split up in several groups when there are more people. The Dutch and English versions of the adventure quest are regularly updated. Pupils from 16 years old, students, adults. Everyone from the age of 16 will enjoy this adventure quest. Extra documents: There is a practical guide (where, when to go…). Price: You can download everything for free. Fill in this online form and get all necessary documents.